I’ve heard a number of commentators and journalists over the last few days, and even one Labour MP, talk about the current Tory ‘chaos’ regarding the EU, with backbenchers in ‘revolt’ against Cameron’s lack of promise of an EU ‘in/out referendum’ during this parliament, and the ‘rise’ of UKIP as a threat to the Tory party because of its attraction to the Tory eurosceptic fringe. The consensus of these commentators was along the lines of this ‘chaos’ representing a grave threat to the Tories as the party risks ‘eating itself’ at a time when it is haemorrhaging votes to UKIP. It’s true that the situations presents a serious risk to the Tories, but to call it ‘chaos’ is incorrect. 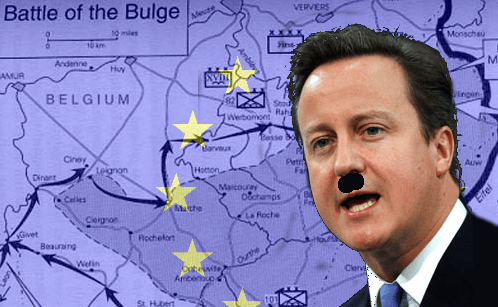 It may have started with a relatively small number of fringe Tory MPs who see our membership of the EU as the central issue of our times – but it has been grasped by the Tory media machine as their ‘Battle of the Bulge‘. In late 1944, Nazi Germany was in retreat and facing an almost irretrievable situation. Hitler thought he had spotted an opportunity for a bold move that would reverse the tide, in spite of internal turmoil within his command – he evaded several assassination attempts during 1944, including the famous ‘Wolf’s Lair’ bomb attempt. Identifying a weak spot in the allied lines and taking advantage of helpful weather conditions that grounded allied air cover, he concentrated a huge proportion of his forces to launch an attack through the Ardennes forest on his enemies. The sudden appearance of so much armoured force at a weak point in the line threw the allies into retreat over a wide area – the so-called ‘bulge’ in their lines that gave rise to the name of the battle. It was an incredibly high-risk strategy, as defeat in that battle would sap German strength fatally and accelerate their defeat – but Hitler reasoned that his defeat was inevitable eventually and that his one hope of victory, or at least of creating a situation in which he could negotiate a truce while he concentrated his efforts on the Russian advance, was in taking the huge risk. He came closer to success than most people realise, but last-ditch resistance and a change in the weather that allowed allied air power to attack his landbound forces, eventually sealed his defeat. So it is with the Tories now. Cameron faced rebellion from a section of his party who perceived his weakness and have been trying to pursue their monomania – an EU exit. However, over the past few months there has been a distinct shift in the Tories’ handling of the EU issue. In the meantime, the constant over-use of Nigel Farage by the BBC on any politics-related programme – his airtime far exceeded what was justified for a party that doesn’t even have an MP and is populated by ‘eccentrics’ to put it kindly – was creating a phenomenon whereby a portion of the electorate that either didn’t know or didn’t care what other policies lay behind UKIP’s headline anti-EU stance were giving him credence. On top of all this, Labour’s poll ratings were consistently 10-14 points ahead of the Tories, and the Conservatives’ lamentable performance on the economy and their obvious disdain for any concept of social justice and care for the vulnerable was providing easy ammunition for Ed Miliband and co. The dire economic performance (to justify continued and deepening austerity) and planned impoverishment are a core part of the Tory plan, so this trend to Labour was set to continue unabated. Suddenly, there was a change in the pattern of media coverage and Tory response. Even more than is usual in the rabid right-wing rags like the Mail, the whole Tory press has focused on the EU, while even supposedly serious organisations like the BBC have started to make the EU the main theme of broadcast after broadcast. Meanwhile, Cameron and co have pandered more and more to their ‘lunatic fringe’, encouraging them to be ever more vocal and demanding. The cumulative effect of this has been to create a creeping impression, without often actually saying as much, that the EU is somehow the cause of our woes, while an exit would be the panacea. Over a very short period, the EU and the stance of various parties on it has become a constant, leading theme on almost any politics-related programme. That this ‘creeping suggestion’ has been effective so far was evidenced by the performance of UKIP in the recent local elections. While the scale of the ‘achievement’ has been vastly exaggerated, because the elections took place almost exclusively in Tory-heartland shires, it is enough to show the suggestibility of some sections of the electorate. I believe that Tory strategists assessed the situation and, a few months ago, decided that their only hope of electoral success at the next general election – or at least of preventing an outright Labour win – lies in launching their own ‘Ardennes offensive’ to change the lines of battle. Just as Hitler threw almost all his forces at a single weak point in the line in 1944, so the Tories believe they have identified a crucial Labour ‘weakness’ in its pro-EU stance and have thrown all their efforts at it in an ‘all or nothing’ gamble. This gambit involves swamping the public consciousness with talk of the EU and its supposed role in our troubles, and banging that drum over and over and over in the hope that enough people will fall into step with its rhythm to erode Labour’s poll leads. It’s a massively risky plan. By making the EU the all-pervading issue – in blatant and willful ignorance of the facts – the Tories risk dividing their core vote and losing any remotely-marginal seat at the next election. Faced with decimation at the next election and no prospect of changing any of the factors that were driving their demise, the Tories have opted to roll the dice and stake everything on the outcome. In the final analysis, Hitler’s gamble was considered a desperate, even suicidal one, doomed to failure. But for a short period the situation was balanced on a knife-edge and anyone looking at the ‘bulge’ on the map might have considered that the offensive was succeeding. It was only desperate resistance by ill-equipped units that managed to delay the German advance until Patton’s 3rd Army could move up and help throw the Germans into a catastrophic defeat. When the German offensive began and Allied forces in the Ardennes were retreating, Allied generals had to formulate emergency countermeasures and rush any available unit into the area to plug the gap. At the moment, the Tory gambit is having some success – although not as much as the media would have us believe. Polls showing a Labour lead of only 6 points are pounced on by commentators who talk at length about how poorly Labour must be doing to have only such a lead in mid-Parliament, trying to create a public perception that Labour is weak and unelectable. However, there is no room for complacency. The media blitzkrieg to turn the EU into the central issue for the next two years to the General Election will continue unabated until Labour formulates an effective line against it. Labour needs to do this with despatch – and I’m sure is working on it. It shouldn’t be impossible to find an effective line of counterattack – because the facts are on our side. The EU is not the source of our troubles – woeful and probably wilful mismanagement of the economy and a series of growth-killing cuts are – and our membership of the EU is a protection against even worse and more rapid measures. It will take some boldness for Labour to change the narrative. Some of the things which, so far, Labour’s leaders seem to have felt were better left unsaid for the sake of the ‘middle ground’ will have to be stated outright and repeatedly, to get more people to see through the obvious but attractive (to some) BS peddled by Farage and the media and increasingly adopted by the Tory front bench. The situation is serious, but not desperate. It requires bold moves, but well-calculated ones. Not panic or the desperate dice-throwing of the Tories but a firm, reasoned, persistent pressing-home of truths that are obvious – but obviously ignored by large sections of the media and therefore unseen by those whose sources of news consists of those organisations. It will need some creativity, too, to bypass or subvert the dominance of organisations that are friendly to the Tories. We need to get to it without delay – and you can play your part by spreading the word whenever you see, hear or read anything that goes against the prevailing ‘weather’ that the Tories and the media are trying to create to cover their desperate ploy. It was the EU issue that made be stand as a candidate, but that issue is small in comparison to what the government is doing to the people of the UK. It is driving the country into bankruptcy which has NOTHING to do with the EU but the coalition and their failure to boost the economy to create jobs that the unemployed would gladly apply for to get out of their poverty trap. The private sector is looking to the tax payer to fund it’s profits,this is the real agenda that is destroying public services and the economy. Labour is being led by career politicians who peddle Neo-Liberalism, explain to the country why this is failing and start getting the private sector out of public life; and the economy will then work for people not corporate interest. If this article, suggesting the Tory focus on the EU is their counter-attack against the (many) issues that are threatening to take that party down to oblivion, then Mr Walker is right that good people like ourselves must counter the arguments they put forward, at every opportunity. They don’t want to leave the EU to make more freedom for you; they want to do it so THEY can get rid of the Human Rights Act and access to justice that currently prevent them inflicting the harm upon middle- and working-class people, both in-work and jobless, that they intend. It is not the EU that is harming the UK’s economic recovery – it’s the Conservative-led Coalition’s economic mismanagement, with growth-killing cuts (as stated in the article) and harmful removal of infrastructure investment. If we can keep reminding the more suggestible parts of the population of these facts, then it will be a matter of time before criticisms over bad policies (Mervyn King on mortgages), backstabbing by Tory grandees (Lords Howe and Tebbit), and abandonment by disaffected local activists (the ‘mad, swivel-eyed loons’, so-called by SOMEONE in the government) will combine with campaigning by the opposition parties to bring down these monstrous anachronisms. I voted for Ukip in the CC Elections, I am not politically minded and politics have never interested me in the past except when there is a general election. I am so fed up with all parties at the moment as I cannot see things improving even if Labour win the next general election. I do know under no circumstances do want to see the murdering coalition get into power ever again but I do want things to improve ie the new welfare bill scrapped or rewritten so it does not attack the poorest & most vulnerable in society. This is what will affect my vote at the next election and all I am hearing from all parties is the EU in/out referendum, this is NOT what concerns me but what they are going to do about the poverty infesting our nation. I am 62 years old and never in my lifetime have I seen things so bad and never in my lifetime and I have lived through many governments have I seen such an UNCARING ,DISHONEST & DEPLORABLE one. I despair I really do.. Behind the EU rhetoric of UKIP lie policies that are even more right-wing, draconian and plain idiotic than most Tory policies. They just don’t make those so public. I’m glad it sounds like you’ll never vote for them again! – The Tories’ deficit in the opinion polls is not catastrophic. Thatcher and Major both won general elections from worse positions at equivalent points in the cycle. Ed MIliband does not have the personal charismatic appeal now that Tony Blair did in 1995. – For the Tories to scrape an overall majority in 2015, they need a few things to happen. First is that the LibDems have to fall apart (check). Second, Labour has to remain unconvincing (the jury is out until we can see some policies). And third, they have to avoid losing the swivel-eyed loon vote to UKIP. To me, that’s what this is about: heading off Farage at the pass. Of course, if Scotland votes for independence, EnglandWales is in for a perpetual Tory majority – “A handmade Oxford brogue stamping on your face, forever”. Labour are being handed quite a few easy wins if only they will grasp them. The most conspicuous is the NHS with privatisation barely concealed and local hospitals being decimated in one way or another. Being clear that this will be reversed would be very popular and save money in the end. It would mean losing favour of some big multinational healthcare corporations and smaller local private concerns that NewLabour cosied up to – Mr Milliband probably doesn’t have a lot of time for them – he’s just got to be brave. That’s not quite true – Labour has said repeatedly that it will repeal the Health Act, it’s just not getting any coverage. A clear statement on reversing the benefit cuts would be most welcome, though! Labour won’t really gain anything by trying to mollify people who won’t vote for them anyway. That is good to know..,thanks! I cannot understand why the media aren’t covering these important issues. Yes, interesting that the Stafford Hospital March, one of the largest single issue (and the largest single hospital) marches ever held in the UK (final figure 51,000) was not covered by any national media network except in retrospect – when the same national media networks will get quotes from 2 men and a dog on the same topic if it suits the narrative. This is what ordinary people, to whom everything is only too clear, are up against. All the more reason for Mr Milliband to be extra brave – nothing to lose but everything to gain I feel.